Welsh metallers BULLET FOR MY VALENTINE have officially parted ways with longtime drummer Michael "Moose" Thomas and replaced him with Jason Bowld (PITCHSHIFTER, AXEWOUND). The band said in a statement: "As most of you know, Jason Bowld has been in the hot seat since November 2015, playing every show we've done since then — killing it every single night. Jase has been a big part of making the last cycle for us our most enjoyable and successful yet, from the live shows through to the writing and recording sessions for 'Don't Need You' last year. "With that said, we'd like to officially welcome Jason to BULLET FOR MY VALENTINE as our permanent drummer. Since initially filling in for Moose in 2015, Jase has cemented himself as an integral member of the BULLET family, and you guys are going to be blown away with what he's brought to the new record. "We'd like to place on record our thanks for everything that Michael 'Moose' Thomas has given to BULLET throughout his time in the band, and we wish him every success in his future endeavours. "Please join us in welcoming Jase to the fold, as [we] know he'd like to thank you guys for all the support and love you guys have given him over the last two years." After BULLET made the split official, Thomas tweeted to thank all the fans for their messages of support. "As soon as I can say what's going on, you guys will be the first to know," he wrote. "It's been a weird couple of years for me, but please hear this: I AM NOT QUITTING DRUMS OR MUSIC! I have been hard at work on something and will announce very soon. 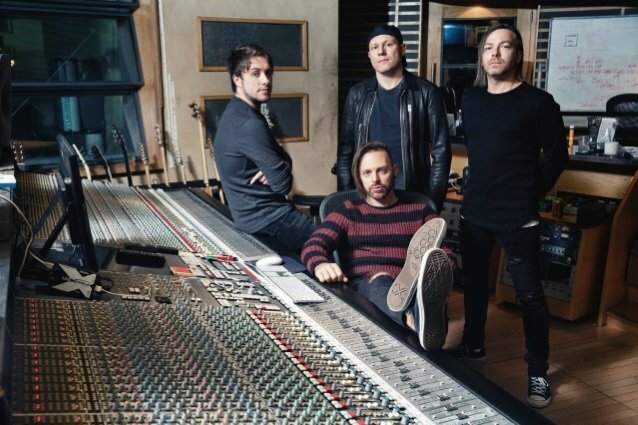 #2018"
In other news, BULLET FOR MY VALENTINE is "99 percent done" recording its sixth studio album for an early 2018 release. "We've one or two cherries to add to the cake, so to speak, but we can say without doubt that we've created something that we're incredibly proud of, and we can't wait to let you hear it," the band said. BULLET FOR MY VALENTINE's next album will be released through the band's new label home, Search And Destroy, the imprint launched in 2014 by Spinefarm and international artist management company Raw Power Management. BULLET FOR MY VALENTINE guitarist/vocalist Matt Tuck told A Music Blog, Yea in June that the group's latest song, "Don't Need You", which was released as a standalone single last November, is "pretty much" a good indication of what fans can expect to hear on the band's next album. "There's some stuff in that vein, and there's a lot of other stuff we've been working which is… kind of a… not new direction, but we wrote two or three songs which are kind of a different sound for us, but we're really happy with, so we're gonna see how that goes, really," he said. Tuck added that BULLET FOR MY VALENTINE has attempted to change up its songwriting approach in order to produce an album that will stand on its own merits rather than follow a tried-and-tested formula. "Stylistically, we just wanna make bigger songs — in a less more busy way, musically, and just really, really focus on the vocal tracks and the vocal melodies and stuff," he explained. "And everything else then is built around it rather than the other way around, which we've done in the past." But this doesn't mean that BULLET FOR MY VALENTINE will completely abandon its signature balance of heavy, coupled with surging melody. "I think this new batch of songs, we're not stepping away from it, but we definitely wanna do something which is not the same as 'Venom'," Tuck said. "So we're just trying to make this album its own body of work rather than a continuation of a sound." BULLET FOR MY VALENTINE's last album, "Venom", came out in August 2015. The CD marked BULLET FOR MY VALENTINE's first release since the departure of longtime bassist Jason James and addition of Jamie Mathias (formerly of REVOKER).